Why you should visit the beautiful lagoon of Bacalar! Well, why you should visit the beautiful lagoon of Bacalar, Mexico? Let me tell you this: 7 Colors of Clear. Blue. Water. It feels like you are swimming in an infinite pool, but this is the real deal! Oh, Bacalar, beautiful Bacalar! One of my favorite destinations of Mexico. I planned to stay for two nights but ended up five! And I wasn’t the only one who fell in love with the beauty of the seven, I repeat seven (!) different colors of blue of the lagoon. Many people booked more night then they initially intended and if you see pictures you understand why! > scroll down for practical information about busses and where to stay! Bacalar is big, and not that touristic -yet- (Probably in a couple of years the town will grow in its facility’s and the prices will rise!) but for now, it’s not big enough to have you entertained for weeks. Don’t get me wrong here, there is stuff to do; like enjoying a boat trip, swimming in a cenote, paddling in a kayak, visiting some restaurants and little stores downtown. But the main reason you should go to Bacalar is just to enjoy, and you will, the amazing blue lagoon! Bacalar is easily accessible by one of the ADO buses. The station is not downtown so you probably need a taxi to get you to your hostel (about 30/40 pesos). 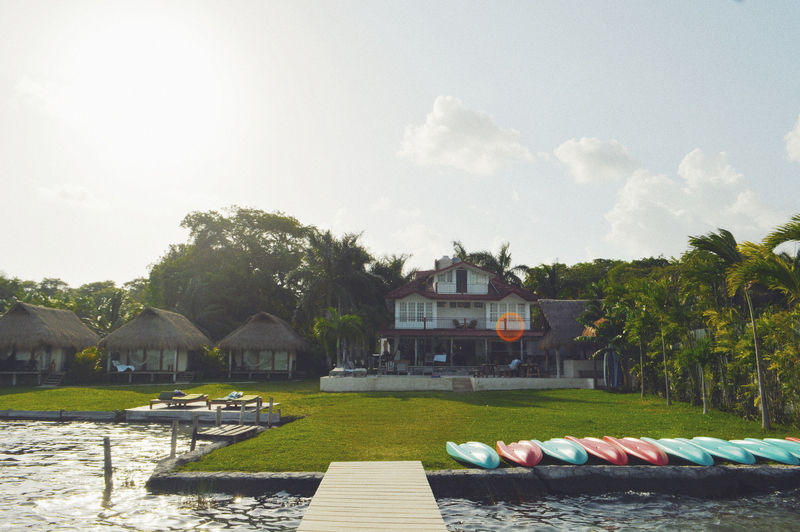 One of the most popular place for backpackers to stay is the Yac Lake House, next to the Lagoon of Bacalar. Unfortunately, it was already full when I arrived so make sure you book it in advance if you want to stay there. I ended up in Casa Bakal, which is not cheap compared with what I’m used to in Mexico, but it was all worth it. The Casa is clean, with a good breakfast and most importantly, with an amazing view of the lagoon! They offer you 24/7 free bikes to go to the city and free kayaks during the day! Thanks for reading! Let me know if you have any questions, I’m happy to answer! Well written and entertaining blog ! Fun to stay connected by this kind of story telling. I think i realy got the feeling you tried to expressed.